The makeup that never looks made up. Meet the cosmetics kit with color so real and radiant it elevates your natural skin tone rather than "making it up". 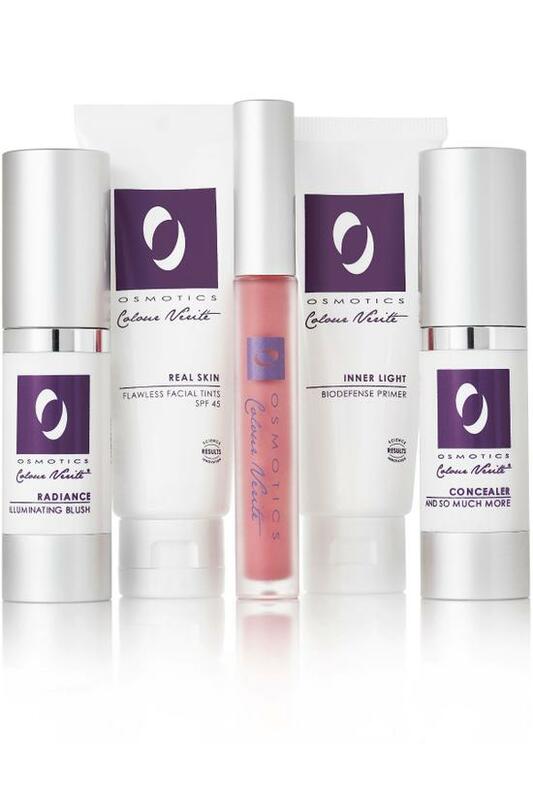 This 5-piece kit includes primer, facial tint, concealer, blush and lip color, all infused with Osmotics signature age-defying formulas. It's never been easier to blur imperfections and bring out your glorious, natural beauty at the same time. · 3-in-1 Real Skin Flawless Facial Tint (1.7 fl. oz.) instantly perfects skin with soft-focus, line-diffusing technology in a sheer wash of color. UVA/UVB SPF45 formula is loaded with antioxidants and vitamins to repair and prevent skin damage. Concealer: Using ring finger gently pat/stipple small amount under eye and on lid (for eye shadow base). Do not rub. Avoid outer eye area. Facial Tint: May be used alone or combined with our Inner Light BioDefense Primer. Apply evenly to face daily as the last step (4) to help protect skin from photo-aging. Leaves skin soft, smooth and glowing! Primer: Apply a pea size evenlyu to entire face. May be used alone, underneath or mixed with Real Skin Flawless Facial Tints for instant complexion perfection. Blush: Gently stipple/pat small dots to cheek bones and blend upward. Lightweight yet concentrated formula is buildable so use sparingly. Lip Color: Apply to lips as often as needed. Works beautifully alone or may be used under/over lip color. Concealer: Water, Dimethicone, Titanium Dioxide, Stearic Acid, Caprylic/Capric Triglyceride, Simmondsia Chinensis (Jojoba) Seed Oil*, Prunus Amygdalus Dulcis (Sweet Almond) Oil, Sodium Hyaluronate, Methyl Methacrylate Crosspolymer, Stearoyl Glutamic Acid, Butylene Glycol, Acetyl Tetrapeptide-5, Glycerin, Steareth-20, Chrysin, N-Hydroxysuccinimide, Pamitoyl Tripeptide-1, Palmitoyl Tetrapeptide-7, Phenoxyethanol, Cetyl Alcohol, PEG-100 Stearate, Kappaphycus Alvarezii Extract, Caesalpinia Spinosa Fruit Extract, Glyceryl Stearate, Carbomer, Tromethamine, Tocopheryl Acetate (Vitamin E), Potassium Sorbate, Ethylhexylglycerin, Iron Oxides (CI 77499), (CI77492), (CI 77491). Primer: Water, Cyclopentasiloxane, Simmondsia Chinensis (Jojoba) Seed Oil*, Prunus Amygdalus Dulcis (Sweet Almond) Oil, Titanium Dioxide, Mica, Cyclohexasiloxane, Dimethicone, Glycerin, Cetearyl Alcohol, PEG-100 Stearate, Glyceryl Stearate, Glycogen, Kappaphycus Alvarezii Extract, Caesalpinia Spinosa Fruit Extract, Diazolidinyl Urea, Iodopropynyl Butylcarbamate, Polysorbate 20, Carbomer, Tromethamine, Disodium EDTA, Tocopheryl Acetate (Vitamin E), Citrus Aurantium Dulcis (Orange) Oil, Panthenol (Vitamin B-5), Retinyl Palmitate (Vitamin A), Tocopherol, Allantoin, Tin Oxide, Iron Oxide. Blush: Water, Cyclopentasiloxane, Dimethicone, Propanediol, Prunus Amygdalus Dulcis (Sweet Almond) Oil, PEG-100 Stearate, Glyceryl Stearate, Cetearyl Alcohol, Dimethicone Crosspolymer, Evodia Rutaecarpa Fruit Extract, Glycerin, Diazolidinyl Urea, Iodopropynyl Butylcarbamate, Carbomer, Tromethamine, Polysorbate 20, Disodium EDTA, Panthenol (Vitamin B-5), Retinyl Palmitate (Vitamin A), Tocopheryl Acetate (Vitamin E), Titanium Dioxide, Stearoyl Glutamic Acid, Red 7 Lake (CI 15850), Yellow 5 Lake (CI 19140), Iron Oxides (CI 77499). Lip Color: C10-30 Cholesterol/Lanosterol Esters, Vitis Vinifera (Grape) Seed Oil, Cocos Nucifera (Coconut) Oil*, Hydroxystearic/Linolenic/Oleic Polyglycerides, Silica, Isopropyl Palmitate, Lecithin, Water, Swertia Chirata Extract, Isohexadecane, Ethylene/Propylene/Styrene Copolymer, Butylene/Ethylene/Styrene Copolymer, Sodium Hyaluronate, Xanthan Gum, Phenoxyethanol, Tripeptide-1, Ethylhexyl Palmitate, Tribehenin, Sorbitan Isostearate, Palmitoyl Tripeptide-1, Butyrospermum Parkii (Shea Butter)*, Mentha Piperita Essential (Peppermint) Oil, Mentha Viridis (Spearmint) Oil, Illicium Verum (Star Anise) Oil, Gaultheria Procumberis (Wintergreen) Oil, Mixed Tocopherol (Vitamin E), Titanium Dioxide, Stearoyl Glutamic Acid, Red 7 Lake (CI 15850), Yellow 5 Lake (CI 19140).